Welcome to the Whimsical Wednesday Grand Opening Blog Hop! We are glad you could join us! You should have arrived from Gigi's. If you're just stopping by and would like to join in on the fun, you can start at the beginning by clicking here. 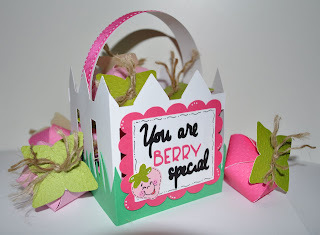 My Community - fence cut @ 4.25"
MS All Occasions Cake - grass border cut @ 2.75"
George - tag rectangle cut @2.94"
Paisley - tag strawberry cut @ 1.24"
Wild Card- "You are special" cut @ 6.78"
Makin' the Grade - "BERRY"cut @ .49"
Please be sure to visit all the blogs in the hop to see what the talented Design Team has in store for you! There is also such fun grand prizes sponsored by The Kraft Outlet and Prairie Bird Boutique, you won't want to miss out! Very cute - love your strawberries! Hello~ I am a fellow design team member & wanted to stop by to say hello & support you during the hop. Your basket & strawberries are just DIVINE! You really set the bar high. Just gorgeous, i am not surprised you got as many orders. Expect more. I am on my way to the next stop. So cute!! I love the strawberries....what a great idea! OMG! I am so in love with this!!! Everything about this makes me so happy! I will be shooting you an email right away to get that gypsy file. :) Tfs. Very Beautiful box . Thanks for sharing. I am sure your friends teacher will be very happy with your wonderful project! TFS. OOOOH! That is so cute!!! I love the strawberry! I am a teacher and would be so excited to receive this. This is just AMAZING! I love the basket and all the details. I LOVE that you used so many different cartridges! I LOVE the fence, the grass, the strawberrie... the EVERYTHING! Those darn strawberries CLEVER! Oh this is something I can't stop staring! Thank You for the link for them... of to hop on the other DT's blog but will be back to see it! Your basket and strawberries are just darling. Thanks for sharing. love this! thanks so much for sharing! What a great gift..so springy and sweet. cant wait to see what you come up with next and I look forward to working with you on the DT. The basket is so springy! I have to say it's a stunning looking project. Can't wait to give it a try. So, so cute. I can see why everyone would want one. Can't wait to see the challenges at Whimsical Wednesday. Oh, what a delightful project. I can see why all these people are placing orders. This is such a cute basket and you are right. The Hershery kisses are the very best. I am so thrilled to be a part of this DT. I look forward to the challenges. Have a great weekend. I can understand your taking 10 orders, they are super cute and very creative. I know I would love to get one! what a cute basket and wonderful idea for the teachers! I'm sure they will appreciate it! TFS and I'm looking forward to working with you on the DT! This is really cute!! Love it!!! Its gonna be great working with you on the DT of WW..
Super cute idea! Love the basket and the strawberries! TFS! Your project is just amazing! I can understand why you have all those orders!! They are really unique, I have not seen anything like them. So creative. Such a pretty basket and colors too. Glad you joined the DT and I can't wait to see your creations. I cant wait too see what you will be making next. Congrats!!! Very cute basket, too cute!!!! Amazing work, love the Stawberry's I'll have to check that out! How sweet! It is a perfect gift for teachers! So creative! I love 3D projects and make one for my daughter's 4th grade class for each holiday. She is a teacher. This is so cute! It would make a cute Easter basket. What a CUTE project!!! LOVE the little strawberries too!!! what a beautiful basket. The berries are too cute. Are they big enough to fit anything in? Love this project. I am sooooo in love with this project! oh my gosh..its just too great! And I just may have to keep that strawberry instructions..those are amazing!!! Glad to be on the DT with ya! awesome project. I am going to have to make some of these berries. thanks for sharing with us at FCCB this week. Love this idea! Too cute! The strawberries are adorable! awesome basket! and those strawberries are so cool! looking forward to following along with you all at wwchallenges each week . Nice job on the box. I love 3D projects. Thanks for playing at FCCB. That is a really gorgeous creation! Love the little face on the berry and the frame shape. This is a cute and sweet project. This is JUST ADORABLE!! I love it!! Happy Spring and thanks for joining us at FCCB!! So cute, I love the fence basket. What a great gift for a child! Love it! What a creative project! Love those strawberries! Thanks for sharing the link. Cute project. Thanks for the inspiration. This is a really cute basket/box! I'll bet it's a big hit with the teachers too! Looking forward to seeing much more of your work in the upcoming challenges. TFS! That's a reaaallly cute idea! Thanks for sharing, and the chance to win!! No wonder you have had so many orders, your basket is gorgeous! Thanks for the inspiration. I can't wait to see what you have for the challenges to come! So cute! I am emailing you now for the gypsy file! Wow Roberta! This is fabulous! Thanks for the link to the patterns - definitely want to try this :) So glad you are on the challenge team - excited to see what you bring us in the future! Such a fun box. The recipients will be delighted! TFS! Love your treat box - too cute! TFS! Oh my, I love that basket! I didn't realize that was on TBBM! Thank you for sharing! This is just the cutest gift. No wonder you got orders for more. Thanks for sharing at FCCB. WOW!! so cute...and I love those strawberries! Thanks for playing along this week at FCCB! Super cute Easter box.... Great project. love the strawberry kisses! adorable project.